Chevallerie Filia Chenin Blanc Brut Nature has An initial burst of freshly baked brioche, lime zest & tart kumquat unfurl from the fine mousse with wisps of crisp green apple, lemon curd, subtle white pear and yeasty notes from extended bottle maturation; while zippy acidity and an unmistakable mineral finish whet the palate begging one to return for another sip. Chevallerie Filia Chenin Blanc Brut Nature is delicious on its own as an aperitif, but also delicious with seafood, such as scallops, seared sea bass or walleye pike. Huis Van Chevallerie is responsible for producing some of the Best Sparkling Wines from the Swartland. 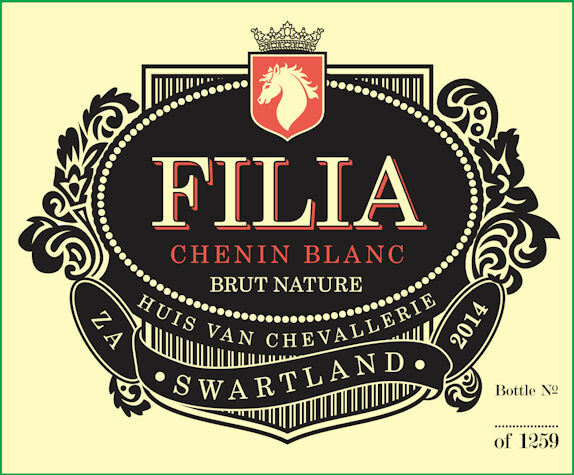 Their Sparkling Chenin Blanc Brut Nature is called Filia. Production from these old vines is extremely low; they only produce as much fruit as they are “comfortable with” and for the past few years, that has meant a meager yield of 1.2 tons/hectare (9hâ„“/ha). However, the fruit these vines produce possess an exceptional richness, complexity and depth of flavour – even though the fruit is harvested at relatively low sugar levels, the inherent Chenin richness comes to the fore.